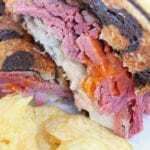 Layer sandwich in the following order: bread, cheese, corned beef, sauerkraut, Russian dressing, and bread again. Melt butter into a skillet on medium heat. Cook sandwiches in skillet until both sides are golden brown and cheese is melted.